God of War. Few games are as iconic, or conjure up such strong emotions in gamers. Kratos’ epic anthology of games has spanned much of Greek mythology. But now, in a soft reboot of the franchise, God of War is set to take place in the world of Norse mythology. We were able to take a deeper dive into the trailer shown at Sony’s E3 2017 press conference, and have our impressions below. Director and Writer Cory Barlog was on-hand to step us through some things that you may have missed in the trailer, since although it was short, it was full of details. There’s a lot going on, so Cory was happy to dissect the video with us, and explain what in the world is going on in the Norse lands. It all starts with the beginning of the trailer. We see Kratos rowing a boat, with his new axe on his back. If you look closely, you can see some symbols on the weapon. These symbols become important in the story, for reasons not yet disclosed, or perhaps left a mystery by Sony Santa Monica purposely, to give gamers time to discover their meanings. A conversation then occurs between Kratos’ son, who we learn has the name Atreus. Hold on a second. Atreus doesn’t sound like a Norse name. The Norse have names such as Brokkr, Thor, and Loki. Indeed, Atreus’ name is Greek in origin. Cory Barlog told us that Kratos would never name a child of his after any Greek god. The name has special, personal meaning for him. What that meaning is will be revealed in due time, of course. Atreus has only known a very simple life, with nothing to do. He serves as a reminder of Kratos’ humanity, seemingly lost to the ages, but perhaps still alive within him. Atreus will not be a burden at any time during gameplay. He can be told to fire arrows at enemies, as we see when he readies his bow. 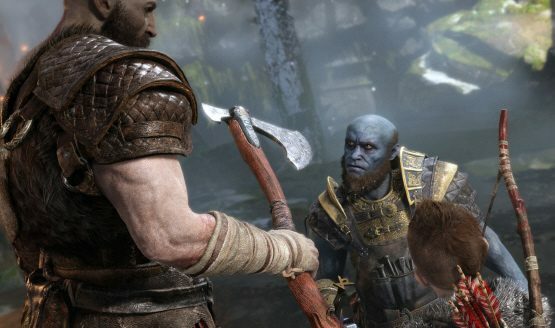 Atreus will also double-team enemies with his father, and does not appear to hesitate to kill any enemy attempting to impede their progress. He may be small, but Atreus is the son of a god, something that Kratos struggles with how and even whether or not he should reveal the truth of his existence to the boy. 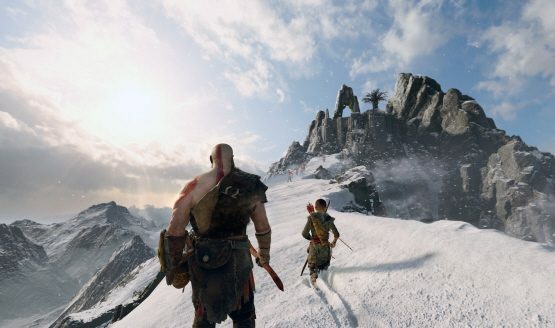 After the conversation between Kratos and Atreus, an ominous voice taunts Kratos, reminding him how far away from “home” he currently finds himself. We are then shown a short snippet of combat – as in Ascension, hand-to-hand combat is an option, allowing Kratos to tear his opponents to shreds. We then see Kratos in action, severing limbs and tearing bodies into bits. One thing you may not have noticed – no button prompts, even for finishing moves. While the game’s interface isn’t completely finalized yet, Cory and crew wanted to get away from some of the more overt gamified concepts from previous games. You can still pull off finishers, of course, but it’s now completely at your discretion, without any real encouragement from the game. We’re also shown a shield that is used both defensively and offensively. A quick shock of an enemy informs the viewer that Kratos wields some elemental powers, as well. Kratos is not a perfect warrior. We are reminded of this when a massive enemy, wielding some sort of red-hot bludgeon, knocks him sky-high, and Kratos bounces off a nearby roof before sliding to a stop. At this point, Cory explains that you as the player should expect to be knocked down a lot. But, as we see, Kratos is ready and willing to get right back up and in the fight, as you should be. In a trailer featuring so much blood and gore and generally serious, dark emotion, a fast bit of comic relief was in order. Enter Sindri. Sindri is a dwarf, and serves as a skilled blacksmith alongside his brother Brokkr. Both are found throughout Norse mythology, and serve as a path to better equipment for Kratos. If he doesn’t kill them first, that is. After some more combat and a lesson voiced by Kratos to Atreus, the boy mentions that not everyone is bad, that “mother always said to be open to those who can help.” Here, Kratos approaches a strange, short creature, who appears to offer something to him. Not everyone in this world will be out to kill Kratos and his son, after all. Next, we’re shown some more rowing; boating will become a fairly intricate potion of the new God of War. 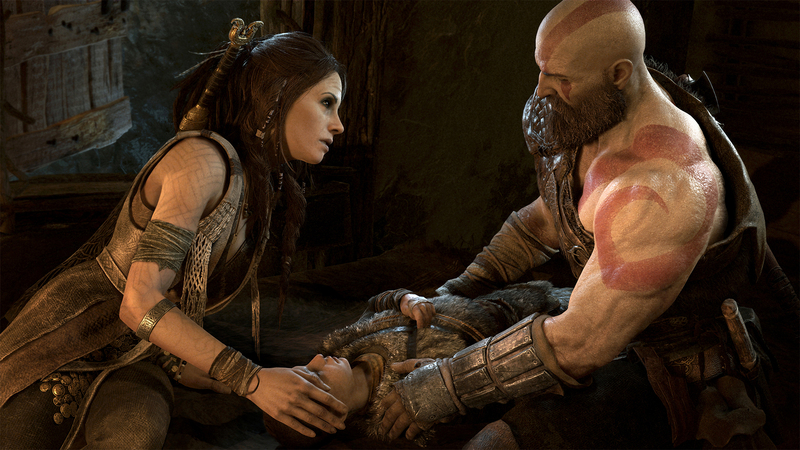 A woman reminds Kratos that who he was before does not matter; the boy is not his past, and is his son who needs his father. Finally, the payoff. Back to the lake where Kratos threw his axe. Something massive emerges slowly, showing us only its enormous eye at first in a scene that is usually reserved for only the largest of creatures. Atreus yells out that this thing is the “world serpent.” It spits something out at their boat – Kratos’ axe! The serpent begins speaking, and Kratos has to ask his son what it is saying. This is because Atreus has grown up in Norse lands, and has learned the language while growing up. It seems Kratos could learn a thing or two from his son, as well.